An accomplished lawyer known for her careful approach to legal issues and commitment to serving tribal communities is the new director of the Indian Legal Clinic at the Sandra Day O’Connor College of Law. Patty Ferguson-Bohnee is supervising the continued development of the rapidly growing clinic, which provides students with important training and skills in the research and application of tribal law. 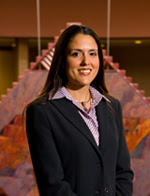 Ferguson-Bohnee, a former associate in the Indian Law and Tribal Relations Practice Group at the Scottsdale law firm of Sacks Tierney P.A., also is a visiting clinical professor at the College. Being able to guide students through real cases in tribal, state and federal courtrooms, while helping Native populations in Indian country and in urban settings around the country, is a good mix for Ferguson-Bohnee. “I’ve always been interested in academics, but I couldn’t really see myself not practicing law,” she said. “As director of the Indian Legal Clinic, I can still practice law, while being in the environment of teaching. It’s also exciting to be able to work with the professors in the Indian Legal Program, who are nationally known.” Rebecca Tsosie, executive director of the College’s Indian Legal Program, said she was delighted by Ferguson-Bohnee’s decision to leave her private practice. “Patty brings a wealth of talent and expertise to this position,” Tsosie said. “Her stellar credentials and commitment to professional service have earned her the respect of members of the State Bar and law faculty alike. Patty is known for her abundant energy and positive approach to law practice, and she immediately immersed herself in the life of the College’s outstanding clinical program and began to organize the Indian Legal Clinic for this year’s classes.” Ferguson-Bohnee, a member of the Pointe-au-Chien tribe, recently helped four bayou tribes, including her own, obtain recognition from the state of Louisiana. She currently is seeking federal recognition of the 700-member Pointe-au-Chiens, of which she is the only attorney, and has assisted tribal entities in government relations by drafting appellate briefs, grievance decisions and codes and constitutions. “I feel a responsibility to my community, because it has been ignored and disenfranchised,” she said. “If I don’t help them, who will?” Ferguson-Bohnee grew up in a rural community in Louisiana where her dad worked in a paper mill and her mother was a stay-at-home mom. She became hooked on law and politics while competing in a mock trial as a high school student. After receiving her undergraduate degree in Native American Studies with an emphasis in Policy and Law from Stanford University, she earned a J.D. from Columbia University School of Law with a certificate in Foreign and Comparative Law. “There were very few Native students at Columbia,” she said. “That was a good experience because I was able to interact with people of different backgrounds, most of whom were interested in public-interest law and rights-based issues.” Initially, Ferguson-Bohnee intended to practice international rights law. “But I had received several grants from Stanford to work on historical projects on Louisiana Indians, and from there, I realized I should be focusing in this area,” she said. After law school, Ferguson-Bohnee clerked for Judge Betty Binns Fletcher of the 9th U.S. Circuit Court of Appeals and then joined Sacks Tierney, where a substantial part of her practice focused on Voting Rights Act issues. She has assisted in complex voting-rights act litigation and has drafted state legislative and congressional testimony on behalf of tribal clients with respect to voting-rights issues. As a lawyer, Ferguson-Bohnee has often returned to Louisiana to speak to high school students and others. “They need to see that they have more opportunities, because they don’t know that they do,” she said. In her role as director of the Indian Legal Clinic, Ferguson-Bohnee said she plans to continue cultivating existing relationships with tribes, while expanding services to other native communities and enabling students to build confidence and gain experience as lawyers. She would like to investigate potential issues within the Inter Tribal Council of Arizona., Inc., that may be appropriate for students to be involved with and start an American Indian rights summer fellowship program for students interested in working in impoverished Indian communities or with indigenous peoples on rights-based issues. This entry was posted in Information, Professors by Indian Legal Program. Bookmark the permalink.